Since 2002, Entec Industrial Furnaces Pvt. Ltd made its position in the national as well as in the international market as reputed Crucible Furnace Manufacturers, suppliers, and exporters of India. This is one of the oldest and the most efficient type of unit which is widely used in melting furnaces. These are thermostatically balanced and highly demanded in various industrial and commercial setups. 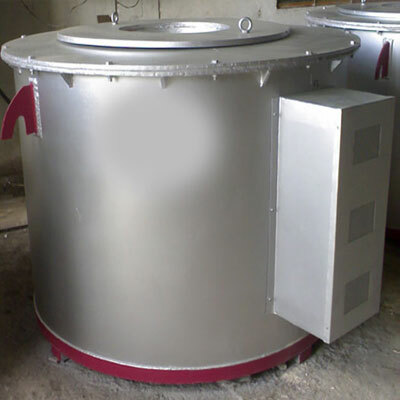 These Crucible Electrical Crucible Furnaces are designed, developed and tested by the team of experts who always work hard and do their best to cater the demand of the customer in the best possible way. Made from premium quality raw material and cutting-edge technology this Crucible Furnace is known for their long service life, dimensional accuracy, easy installation, rugged structure, high-efficiency and trouble free performance. The high demand of our product made us trustworthy Electrical Crucible Furnaces manufacturers, suppliers, and exporters of India. We are proud to announce that, our product and after-sale services are highly appreciated by our clients. We commit to never break their faith in us. If you are interested in buying any of our product range, feel free to send enquiries. Based on the rich technical experience and a team of professional, we establish our brand in the national and the international market as one of the top-notch Crucible Type Aluminium Furnace manufacturers, suppliers, and exporters of India. Since 2002, Entec Industrial Furnaces Pvt. Ltd made its position in the national as well as in the international market as reputed Crucible Furnace manufacturers, suppliers, and exporters of India. This is one of the oldest and the most efficient type of unit which is widely used in melting furnaces.